The world is witnessing the 4th industrial revolution driven by the phenomenal adoption of IoT in various industrial sectors. Among the several areas that are impacted by this revolution, is the supply-chain operations and management. Putting the IoT maturity into perspective, and considering its fast-paced adoption for business transformation, it is of paramount importance for supply-chain strategists to explore the potential it has to offer. We worked with a Food Services giant based out of UK who wanted to implement IoT Solution using Bluetooth Low Energy (BLE) Sensors. They wanted to upgrade their existing GPS enabled PDA based remote billing system to a more advanced Cross Platform Mobile application capable of handling remote billing as well as temperature monitoring. The Microsoft Azure based IoT solution deployed, enabled remote monitoring capabilities offering complete supply chain visibility. Additionally it provided virtually infinite scalability, billing-on-the-fly for infrastructure requirement, advanced analytics using Power BI & Azure Event hub for billions of data records created every single day, and most importantly pushing infrastructure to Azure PaaS that directly integrates with physical devices (Sensors) via Cross Platform Native Mobile applications. Azure’s IoT technology suite was used to build the solution. It comprises Event Hub, Stream Analytics and MS Power BI to interface with BLEs at real-time. The BLEs monitor temperature of refrigerators mounted on the client’s truck fleet communicating data to mobile app. The app further bridged the temperature data to the Dynamics AX backend for advance analytics. Today the IoT enabled system handles 500+ BLE temperature sensor which generate 2.5-million events/day and more than 1.5 million mobile-transactions per month. The Food Corporation enjoys connected enterprise which integrates Microsoft Dynamics ERP with mobile, cloud, physical devices and analytics engine. They have reduced cost due to food spoilage to a mere 5% as opposed to 20-30% before implementing BLE sensors. We will present a case study on how the use of IoT helped our client create a connected enterprise by integrating ERPs, CRMs and Supply Chain with mobile, cloud, physical devices and analytics engine. We will showcase how other enterprises can obtain real-time visibility of supply chain, enabling highly efficient operations and increased customer service quality. It will also be showcased how IoT based Advanced Analytics engine gives real-time insights from business operations, which is not possible at ‘real-time’ otherwise. 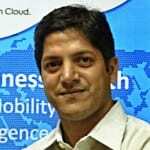 Dhawan Rathore leads Saviant Consulting as a Technology Project Specialist. He comes with over 12 years of hands on experience in Technology Analysis; Strategic Project Management and Development using Agile-Scrum; Custom Applications Solutions & Product Development Management; Solutions Architecture, Process Planning and Global Customer Relationship Management. He has exclusively worked across several domains viz Automotive-Manufacturing, E-commerce, Healthcare and Logistics. He has strong understanding of Waterfall model, Agile Scrum, Iterative methodology and Operations & Support for solutions implementation. Dhavan is a technology specialist in Windows Azure Platform deployment, Azure Mobile Services, Cloud Services, Windows Phone 8.1, Xamarin based movile apps development for Andorid, IOS and Windows OS, Microsoft.Net,C#, ASP.Net 2.0/3.5 and SQL Server 2008.